With the much-anticipated new communications regime not starting for another month, no change for the BoE today meant today was a non-event. However, we have had 24 hours to digest the post-election “emergency” budget delivered by the Chancellor yesterday. It turned out, once again, that Osborne’s bark is worse than his bite. Throughout the election campaign, the Conservatives ran on a platform of supposed superior economic and fiscal management. The unfortunate (or put another way, completely wrong) analogy of household budgeting and the fiscal position was used time and again to ram home the case for further austerity. The Conservative manifesto indicated that there would be further deep cuts to spending in order to bring the fiscal position back into surplus in the next 3 years. Remarkably, some might say, this turned out to be an electoral winner everywhere except Scotland (where the SNP ran a powerful anti-austerity campaign). So we were all waiting with bated breath to see precisely how the numbers would look once the Treasury and Office for Budget Responsibility got their hands on them, and what, if any, adjustments the Chancellor might make to the manifesto policies. And so it was, that Osborne pulled a rather surprising rabbit out of his hat yesterday, by delivering a budget that was more akin to the austerity ‘lite’ we have actually seen in Britain over the past five years. 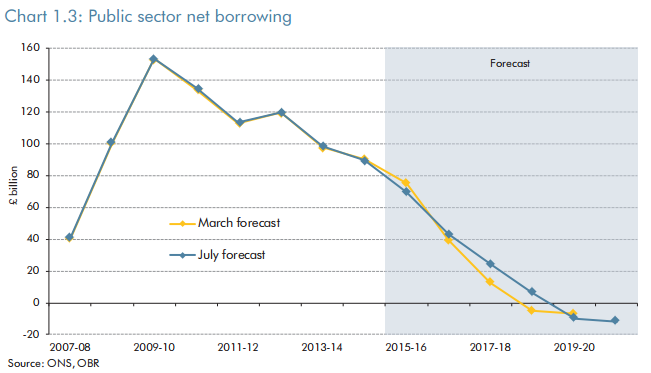 This is not to say that there hasn’t been, and won’t continue to be, a very significant fiscal tightening in the UK. But rather that it has happened much more slowly than the Conservatives ever said would be the case. The budget is now expected to return to surplus another year later than previously indicated, in 2019-20. That is a full 4 years later than had been originally planned when the Conservatives (and Lib Dems) took office in 2010! It means that the fiscal consolidation, which started out with a budget deficit around 10% of GDP, will have taken nearly 10 years to eliminate. And a good thing too. The original pace of tightening was far too harsh, and would have put far too much pressure on monetary policy to maintain aggregate demand. There are, of course, plenty who think that the tightening should have happened even slower, or not at all. I think they forget the fear that pervaded markets in 2009. The UK had spent vast amounts bailing out the banks, had let the automatic fiscal stabilisers kick-in. It had the largest fiscal deficit in the developed world and the prospect of government debt to GDP rising to a level that could become very uncomfortable. I believe the UK government felt that it needed to differentiate itself, for fear of the market turning it into a pariah. But coming back to yesterday’s Budget, the key message for me was that the fiscal envelope was little changed from the March Budget. If anything, policy will be very slightly looser in the near-term, and a bit tighter further out. But the differences are not large. Taxes will be raised, spending will be cut, the fiscal impulse will be negative for some time yet. But no more so than was already built into the BoE’s most recent Inflation Report forecast (which, I might add, the press very unfairly criticised for not updating to something closer to the Conservative manifesto numbers – it’s a good thing they didn’t!). So bottom line, I don’t see this Budget changing the course of monetary policy. But there are a couple of other things worth noting. 1) The raising of the minimum wage to the new National Living Wage has already been argued by some as something that will worry the BoE enough to tighten earlier/faster. I doubt that very much. The implicit wage increases are material for those at the bottom of the distribution, but there will likely be some cost born through overall hours worked. And if you buy the OBR’s analysis, the impact on aggregate wage growth is minimal. Equally, any boost to consumption will probably be offset by the hit to working tax credits. 2) The Chancellor has decided to wind back the bank levy and introduce a top-up rate for bank profits. This doesn’t look like something the Treasury have cooked up, but rather something that has come from the Chancellor’s office. The bank levy was announced in 2010 as more than just a tax on banks, but an important way of reducing systemic risk, by incentivising them to hold longer-maturity liabilities. It’s application to the global operations of UK banks was again seen as a key element of reducing the systemic risk to the UK. No doubt the levy has proved more complicated than expected to manage, and has already been tweaked several times. But by reducing its role so significantly in favour of an increase in conventional tax on earnings, the Chancellor seems to have ignored all the preceding work on systemic risk. On one level, I think it is good for the government to leave those issues to the BoE. But there is no mention of that being the reason for this change (which is expected to be slightly better the fiscally neutral). Rather it seems that concerns about HSBC going off-shore might have more to do with it!